We want to start this section by saying a deep and sincere thank you to all of our fans. You all have been amazing throughout Hive Jump’s development. THANK YOU! Giving specific release dates is always difficult for game developers. What if you fail to meet those dates? What if you reach that date and the game just isn’t fun? These are real questions that haunt developers every time we sit down to plan our next few weeks or months of work. 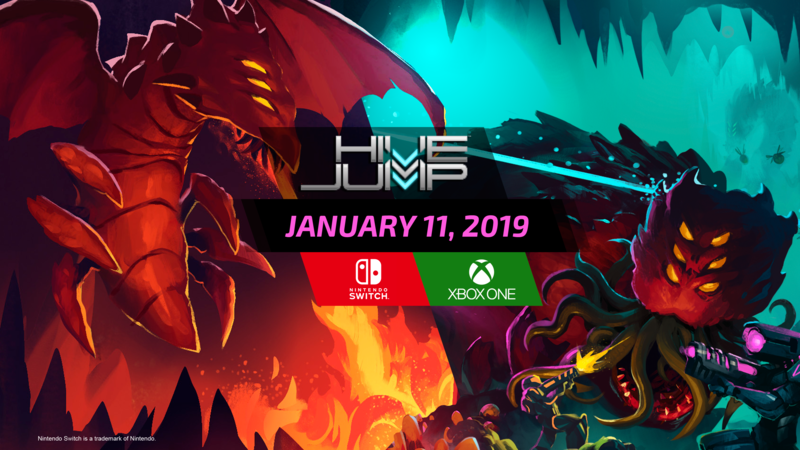 However, we’ve reached a point in our development where we’re confident enough to share our target month for Hive Jump to release on Steam as an Early Access game. Hive Jump will be available on Steam Early Access July 20th, affectionately referred to as “JUMP DAY”. We plan on having a closed-alpha testing period for our Alpha backers and PayPal Alpha Supporters leading up to the EA launch between July 1st – July 8th. We’ll have more details on this closed testing period as we approach those dates, including your Steam Keys! Why Early Access? The simple answer is that by launching as an Early Access title we will be able to make Hive Jump the best possible game it can be by getting our loyal fans involved sooner, rather than later! We’ll collect far more user feedback via Early Access players than we would be able to on our own, this is especially important for the online multiplayer aspects of the game. As an added bonus, we’ve included Daily and Weekly challenge modes! So get ready for some friendly competition as you return each week to post high scores, then stick around to see what’s changed in the game with each and every update. What platforms will be available for Early Access? Initially Early Access will be PC platforms only, but we will be rolling out Mac and Linux versions shortly thereafter and testing the cross-platform multiplayer as part of the Early Access period. Thanks again to our Mac and Linux fans and we hope to jump with you all shortly after EA Launch! Pheromone Sac – A fleshy sac filled with vestigial Ordovician pheromones. It is theorized that early in the species’ evolution, the Ordovicians used pheromones as a medium for communication and establishing social order. For example, the queen of a hive would issue orders instinctively via pheromones to all the workers and soldiers within the hive. However, our current understanding of the Ordovicians as a space-faring species capable of waging interstellar war proves that the species has evolved far beyond relying on pheromones as a communication agent. Regardless, the H.S.A. has found limited success in coating Jumper armor with these pheromones as a method for masking their threat level within a hive. Arc Welder – A family heirloom belonging to a H.S.A. Engineer named Kirk. Arc welding, a popular technique for fusing metal in the 20th and 21st centuries, has been replaced with superior nano-assembly and reconstruction techniques. However, such advanced techniques are not available in the hostile and hectic environment of an alien hive. When this heirloom was discovered by a desperate band of Jumpers deep within an alien hive, it seemed as though fate had smiled upon them in their moment of need. The jumpers were able to perform emergency repairs to their transponder backpack and complete the mission. The Wii U version of Hive Jump will be local co-op only. Online play for Wii U has been an interest for Hive Jump, but not something we could guarantee at the onset of our campaign, so we listed that as one of the first FAQs we posted during the campaign. We explored online MP for Wii U thoroughly and deeply over the last year. We’ve refactored our code several times to optimize and improve – to explore this feature. We looked at other titles and we talked to fellow devs about their own experiences with online play. We evaluated other tools to provide any efficiency we could uncover. In the end, we had to make a tough choice about a stark reality. Online MP for the Wii U was going to be beyond our capabilities for this release due to time and budget constraints on our team. We appreciate all of the support shown to us by Nintendo fans – and we apologize for not explaining our process when evaluating the feature much sooner. We are confident that the game will be an amazing single player and local co-op experience for our Wii U players!